The annual May Day celebrations are an incredibly strong tradition in Oxford, involving rising early (or staying up all night) to hear the choir sing from Magdalen tower, Morris dancing, folk music, May balls, sumptuous breakfasts and of course, 6am pub openings, in a rather joyful community event which attracted over 20,000 people when it landed on a bank holiday Monday in 2017. Cut to the chase and get your May Day breakfast info! You can safely assume that this bit of May Day will stay the same year in, year out. The Magdalen College choir will sing the 7 minute long Hymnus Eucharisticus from the Great Tower as the sun comes up at 6.00am, followed by a madrigal or two and prayers. Afterwards you can expect to hear 20 minutes of expert bell-ringing from the Oxford Society of Change Ringers. The Oxford May Morning celebrations make up the largest audience of bell-ringing in the UK, with the possible exception of some royal weddings. The bridge will be closed to drivers from 2.00am and reopen as soon as revellers have dispersed, which should be around 9.00am. 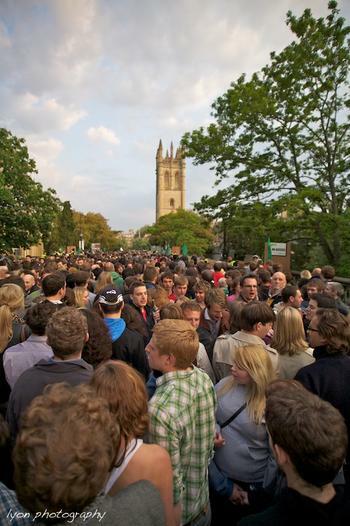 Magdalen Bridge will be open to pedestrians and closed to drivers and cyclists this year. If you’re coming to listen to the choir then it's worth getting near the bridge around 5.00am as it gets very busy from quite early on. The 2018 crowd management system will remain in place this year, with one-way channels created to enable the crowd to flow during and immediately after the event; people wanting to cross the bridge on foot will need to ‘keep left.’ Please note that bicycles - ridden and pushed - will not be allowed to cross the bridge during the event. There will also be designated gathering areas for wheelchair users, families with young children and those with buggies in the car park of Magdalen College School and in Rose Lane. Check the Oxford Bus Company and Stagecoach websites for service updates on the buses they will have to reroute to avoid Magdalen Bridge, generally these divert towards Iffley Road – Donnington Bridge – Abingdon Road. Oxford City Morris Men and Oxford University Morris Men will dance alongside other local sides including Eynsham Morris on May morning. The groups will collect the crowds at Magdalen Bridge after the choir have finished up, and process down High Street, beginning dancing, as usual, in Radcliffe Square between the University Church and the Camera at about 6.15am. After that the dancing will continue at various points around the city (interrupted by breakfast) including outside the White Horse on Broad Street and near the Martyr's Memorial on St Giles. Other sides are likely to be found elsewhere in the city as well. The dancers may then migrate as in previous years to North Parade for more dancing, music, singing etc. from around midday, until exhaustion (or beer) gets the better of them. 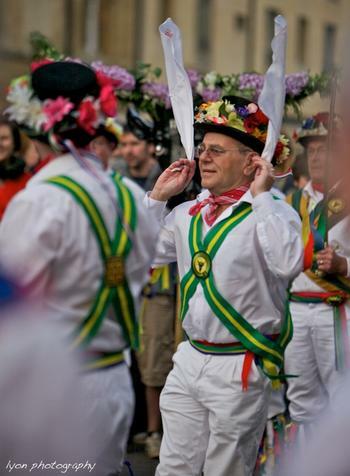 Over in Jericho, the Headington Quarry Morris Dancers will be dancing well-known Morris dances (Morris and Rapper) outside the Anchor in Jericho from 6.30am. 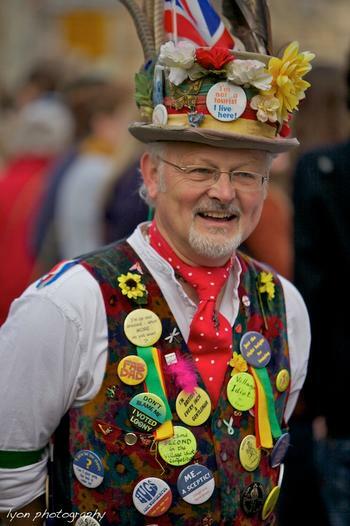 If you want to know more about Morris dancing (and so you should!) then, of course, we have got a handy page to explain this traditional form of dance just here. If you fancy something a bit more lively after the choir then head to the steps of the Clarendon Building on Broad Street for 6.15am to hear the now-traditional (since 2004!) Whirly Band. This green-clad gang of Oxford's finest pipers, drummers, fiddlers, squeezebox players and assorted folkies will be welcoming May in with Rough Music that's old as the hills and as fresh as spring. Come shake yer bones and remember you're alive! Sol Samba will be performing on Magdalen Bridge after the choir have finished singing up in the tower. Horns of Plenty will play a set at Queen's Lane. The Horns are expected to decamp to Radcliffe Square after that, before finishing with a set in the Vaults and Garden cafe. 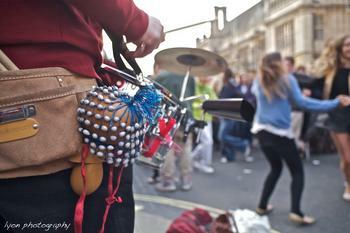 Check out the wonderful www.maymorning.co.uk for a thorough overview of Oxford's May traditions including information about where to find all sorts of musical fun throughout the morning. Part of the fun of May Morning can be staying up the night before. We've gathered here some of the different events happening around the city so you can start your May Day celebrations the night before the morning after. See the sidebar on the left of the page for all these events collected in one place! Full English, breakfast baguettes, pastries etc., served tirelessly through the night and day! An East Oxford institution, they've been doing May morning longer and harder than anyone else. Legit. Open at 4am with an outside stall serving hot breakfasts. Open for tea, coffee and lots of pastries from 5am! As usual, serving delicious bacon sandwiches and sausage sandwiches, as well as alcohol for all. Serving normal breakfast menu, including Full English, vegan brekkie, pancakes, croque madame and salmon & eggs. Serving alcohol and full English - just what the doctor ordered. Ideally placed between Magdalen Bridge (choristers, coffee) and North Parade (Morris, beer), Green's will be serving porridge, bacon and sausage baguettes, scrambled eggs on toast and paninis as well as their full English, simple and vegetarian breakfasts. They also have vegan sausages so can do vegan breakfast. Jericho Cafe will be open at 6am, serving their usual breakfast menu. Regular and bottomless brunch all morning from 6am! Open with their normal breakfast menu including breakfast bagels and freshly cooked waffles! Serving hot bar snacks, teas, coffees and pub drinks. Serving their usual menu plus bagels and pastries pre-made and ready to go! Breakfast baps, tea, coffee and beer, with additional Morris dancing. Live music plus a BBQ (bacon & sausage sandwiches, burgers) before full menu at 12noon. Serving coffee, cake and empanadas. Teas, coffees, brunch and beer. Serving full breakfasts, coffee, and much-needed Bloody Marys. Open for breakfast from 6.30am. Day of activities including craft workshops plus all their usual teas, coffees and vegan cakes. Thanks to Lyon Photography and Andrew Ogilvy for the sublime photography in the sidebar.